These are the most famous starfighters from Star Wars movies 1-6, with brief descriptions of them. 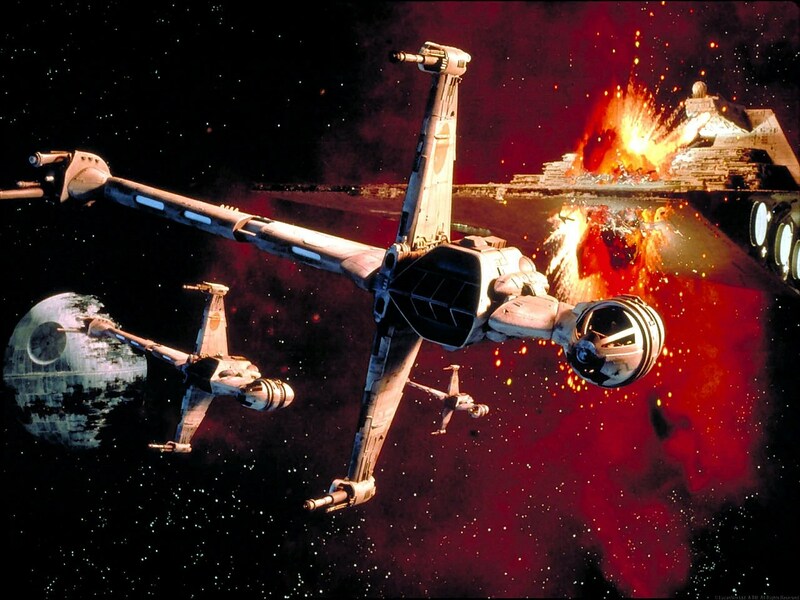 X-Wings may be the most obvious starfighter in all of Star Wars, but that doesn’t mean that they aren’t the best. A laser cannon on each wing, a proton torpedo launcher, hyperdrive, life support, and an astromech socket, it is the true classic. If we could step into one starfighter’s cockpit, it would be this one. Perfect for everything from bombing runs to scouting missions, Y-wings are the workhorses of the rebel fleet. Earlier models were fully armored, however some of the armor plating was removed for enhanced maneuverability. The chilling whine. The menacing design. Twin Ion Engine Fighters are the main force of the Imperial Navy in episodes 4-6, and they earn their keep double. The Chosen ride of Darth Vader, the TIE X1 is a heavily armored version of the TIE reserved for the Imperial Elite. Han Solo’s smuggling starship is a scoundrel’s paradise. With two quad-laser cannons, smuggling compartments, an array of concussion missles, it is truly the fastest hunk of junk in the Galaxy. Boba Fett’s flagship has everything a bounty hunter could need: two twin-laser canons, two proton torpedo launchers, ion canons, seismic charges, heat seekera, and an amazing hyperdrive. Much like it’s pilot, it never runs out of surprises. The fastest fighter in the rebel fleet. Take a lesson from Yoda: judge it by it’s size do not. 3 words: gyroscopic rotating cockpit. An elegant starfighter for a more civilized age, used exclusively by the Naboo Royal Fleet. The Delta 7-b Aethersprite-class Light Interceptor has seen it all; no wonder the galaxy’s protecters make it their fighter of choice. The Alpha-3 Nimbus-class Interceptor was used by both the Republic and the Empire. It walks. It talks. It’s the creepiest Seperatist starfigher ever. It takes 3 clone troopers and an astromech to operate, and the result is amazing.